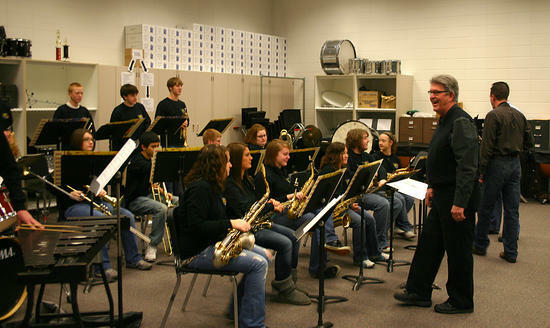 Are you looking for a way to jump-start your jazz ensemble? 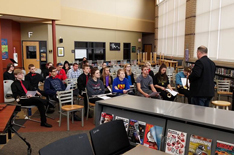 The members of the Des Moines Big Band are ready to bring their decades of experience on the bandstand and in the classroom to you. We provide a music-first approach to instruction, and have the technique to demonstrate what kids need to hear. We love jazz, and we love sharing just why that is to young people! DSMBB will host you in our venue, or bring the band to your community, and let your kids "look under the hood". This could include clinic, concert and joint concert factors. DSMBB will host you in our venue, or travel to your school to provide up to five experienced clinicians for your band day or retreat weekend - or even just to work the band before contest. 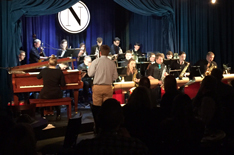 Bring your band to downtown Des Moines to be a part of our weekly performances at Nocé! This is a great opportunity to show kids how exciting live jazz can be, and give them a chance to stretch out!